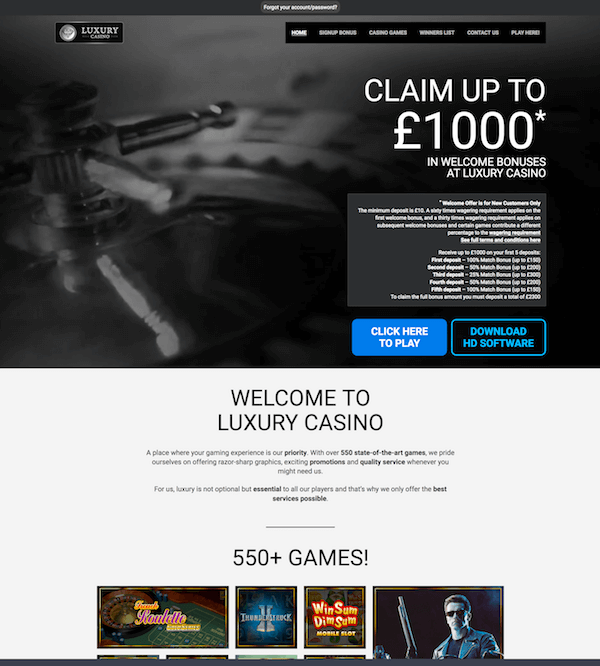 Luxury Casino Review - Get £1000 In Welcome Bonuses! Luxury Casino is managed by Apollo Entertainment Limited, a Malta based company regulated by the UK Gambling Commission, Kahnawake Gaming Commission (Canada) and Malta Gaming Authority. The casino was launched back in 2011, as a part of the Casino Rewards Group and their Microgaming-powered online casino network. The Luxury Casino can be downloaded, launched directly from the browser, or played on mobile devices. Luxury Casino layout will give the players an option to choose from HD downloadable software and Flash version with over 500 games. The choice will not affect your eligibility for the welcome bonus offer of up to £1000 bonus cash. The games are classified according to the structure, type, and release date. Once you launch the New Games category, the irony will not escape you – some of the titles have been on the market for years, although the latest releases are included. 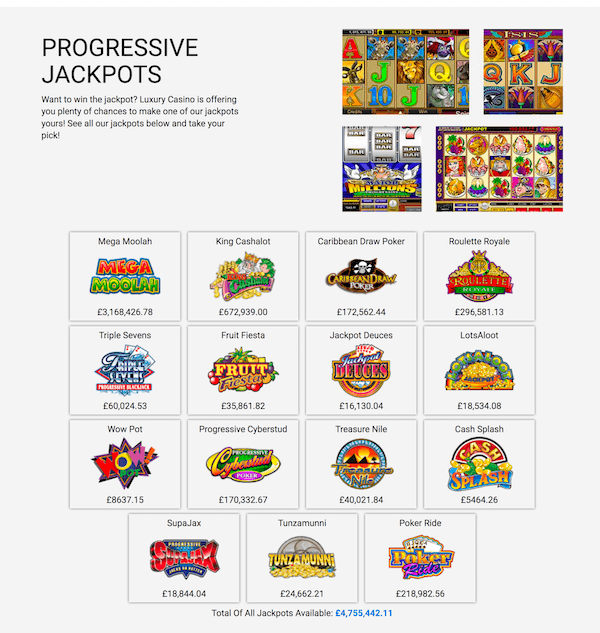 Progressives section is the home to Mega Moolah and a couple of more slots with progressive jackpots – Cash Splash and Treasure Nile. This category offers a modest selection of games; still, all the essentials are here: American Roulette Gold, Atlantic City Blackjack Gold, Classic Blackjack Gold, Euro Roulette, American Roulette… The minimum table limit is £1.00, and the games are available in demo play. You’ve probably guessed that this is where specialty games are stored, or shall we say specialty game – singular. At the moment, only Poke the Guy is available in this category. Live tables at Luxury Casino are streamed from Evolution Gaming studios and the Luxury Casino account holders will be able to play at live baccarat, blackjack, Caribbean stud poker, live casino holdem, roulette, ultimate Texas holdem, and three card poker tables. All the recently launched games will be recorded under the Last Played section, which will enable the users to keep track of their casino activity. After completing the registration process and funding your casino cashier, the new UK account holders will be able to claim the Luxury Casino welcome bonus offer which covers 5 deposits. Luxury Casino accepts Visa, MasterCard, Visa Electron, Neteller, Instant Banking, Entropay, Ilixium, Skrill, Entropay, Paysafecard, ecoPayz, UPayCard, Bitcoin… The minimum withdrawal is £50 unless you are using Direct Bank Transfer, in which case you will need to request at least £300. Players who win an amount x5 higher than the total sum spent in Luxury Casino (and other online casinos that belong to the same network), will not be able to withdraw more than £4,000 a week. Luxury Casino mobile features 150+ mobile games which the players can access immediately after launching the casino on smartphone or tablet. The site layout is fully compatible with touch technology and the site is just as easy to navigate on your phone as it is on your desktop. What Sets Luxury Casino Apart from Other Online Casinos? Luxury Casino has a progress-based loyalty program, which means that additional levels will be unlocked depending on your casino activity. Each level offers a new set of perks (personals account manager, additional bonuses, birthday gifts…) and the loyalty points awarded on your casino visits can be exchanged for chips. Extra points can be earned by taking part in the casino’s promotions. The best part about their VIP scheme is that it’s not limited to high rollers only; as long as you continue to play at Luxury Casino at a regular basis, you will be able to accumulate the points and advance through the membership levels.